Is the Market for Cloud Storage Gateways Collapsing? After reading Gartner’s Market Guide for Cloud Storage Gateways, published on November 30, 2016, any confidence you had in the cloud storage gateway (CSG) market will be shaken. By 2019, 50% of the vendors in the cloud storage gateway market will be acquired for low multiples, raise down rounds or completely fold. Indeed, the CSG market is in the ‘trough of disillusionment’ stage. At HubStor, we feel the Gartner report offers a much-needed reality check on the cloud storage gateway market. However, I also feel that the report lacks a complete characterization of the reasons why the CSG market is not achieving rock star status. Before sharing some analysis, I want to be clear that we see HubStor as the leading alternative to CSGs. Many of our clients began their journey evaluating CSGs before subscribing to HubStor. In this post, we will share our perspective on why the CSG market is in for turbulent times, and we will highlight how HubStor is a smarter approach to cloud-integrated storage. Six or seven years ago, the total addressable market for CSGs would have seemed unlimited. The big storage vendors had not yet made a play with the cloud, and enterprise file sync and sharing (EFSS) vendors like Box and DropBox were just starting to become known with little penetration into the enterprise space. Hype for “the cloud” seemed to be at an all-time high; the business world was supposed to be shifting to the cloud overnight. You can imagine how entrepreneurs and investors thought a CSG would be the ultimate solution to capitalize on this giant shift towards cloud storage adoption. Fast forward to today, and where do we see the CSGs providing the best value? At first glance, it is hard to say. The spectrum of CSG vendors position themselves for use cases ranging from backup, file sync & sharing, archiving, a gateway to object storage, and a unified, global file share namespace. How much of this is reality in terms of actual market adoption? Being outpaced by startups means they either have blind spots in their product strategy (not listening to customers? ), or they have limitations in their ability to execute (not continually innovating, product quality issues, outsourcing too much of their engineering?). That the EFSS market would go mainstream in the enterprise space is not a surprise; this was evident four or five years ago, if not even earlier. The question is, why did CSG vendors fail to recalibrate and dominate the EFSS space? Some, like Nasuni, have recently announced EFSS capabilities, but is it too little too late? Storage vendors building CSG features into their offerings should not be a surprise. If an incumbent adding an element to its offering negates a significant portion of your value proposition, you have to wonder if your offering is substantial enough to build a company around. With a four to five-year head start, CSG vendors should have established enough of an innovation beachhead to be unaffected by storage vendors adding basic cloud tiering options. 1. They play in the hardware game (most of them). I do not think that being in the hardware game has been a strategic advantage to CSG vendors. I would suspect that managing the hardware side of their business – OEM contracts, engineering, quality, support, and delivery – is a boat anchor of constant burden and distraction on their ability to double-down on software innovation. At HubStor, we often hear things like, “I do not want to add new infrastructure that I have to manage.” The cloud is predominantly ideal for archive workloads, and often with archiving, the goal is to reduce your on-premises and primary storage footprint. Adding a CSG appliance to your environment does not align with many people’s idea of using the cloud. 2. They position themselves as net new storage infrastructure. Whether a physical or virtual appliance, a common characteristic of CSG products is that they show up as a new storage mount point on your network. In many cloud use case scenarios, this is a headache. You are managing new volumes. There are adoption barriers to consuming that storage. You have to re-architect applications, or you have to migrate data which usually entails changes in metadata and loss of security ACLs and data ownership. IT professionals commonly tell us they want something that works seamlessly with their current storage infrastructure and can apply cloud policies to the data in-place. 3. Their pricing models do not align with the market. Because many of the CSGs are in the business of shipping storage, their price tag is significantly more than you might expect. Plus, they have the cloud aspect that they price into their solution. So you have the mixed paradigms. As the Gartner report mentions, vendors like Panzura are finally moving to a subscription model. When your goal is to leverage public cloud to reduce infrastructure, and the pay-as-you-go model entices you, it is easy to see that CSG vendors have not nicely aligned their commercial model to what the market wants. 4. They pay little to no attention to enterprise use cases such as data governance, data classification, litigation, and compliance. When CSG vendors market themselves as an archive solution, it is important to recognize that their definition of archiving does not align with what many IT buyers have come to expect from an enterprise-grade archive solution. If you define archiving as ‘just put it somewhere else’ then a CSG fits the bill, but if archiving means non-primary storage with a comprehensive suite of data governance and discovery controls, then CSG solutions are akin to backup tapes regarding their merit as an archive. Experienced IT buyers want to know, before storing their data in the cloud, how they can handle a litigation scenario, for instance, where they need to efficiently identify/search, preserve, and collect targeted datasets. They also want to know that they can audit the data that they are storing in the cloud; and report on it and apply data management policies to manage retention, data classification, chargeback, etc. CSG products hinder not help you in these scenarios. 5. They do not resolve buyer concerns over lock-in. Sophisticated buyers are concerned with vendor lock-in, and this concern is amplified when they are looking at trusting their data to a cloud provider. The lock-in problem applies to the technology and the vendor’s contractual terms. Unfortunately, on both fronts, CSG vendors have a more protectionist commercial approach with their clients, both contractually and technically. There are other issues as well, such as multi-tenant cloud architectures that commingle customer data on shared resources, not giving customers the option to leverage their cloud account, and constraining data management capabilities with arbitrary snapshot or container-based data storage designs on the backend. Are EFSS Vendors the Better Solution? EFSS solutions have become the “choice for enterprises seeking to modernize their file sharing and collaboration environments,” says the report. By 2018, 70% of EFSS destination vendors will cease to exist, having been acquired or put out of business, and the remaining 30% will evolve to support the digital workplace or modernize corporate data infrastructures. EFSS solutions are a great alternative to traditional user file shares and home directories, and they are a great alternative to clunky old Enterprise Content Management (ECM) and document management solutions too. However, IT leaders have diverse scenarios that can benefit from cloud storage, and there are multiple unstructured data workloads aptly suited for archival where EFSS is not the right solution. In case you have the sense that EFSS completely negates the market need for CSGs, let us be clear that this is not the case. CSGs solve problems that EFSS vendors do not. Despite the supremacy of EFSS solutions in the file sharing and collaboration opportunity, I think CSGs still have a healthy total addressable market. The Gartner report correctly states that CSGs are the better file sharing and collaboration solution where the organization works mainly with large files, such as with architecture, engineering, and construction firms. CSGs are also a better fit if you want to leverage private cloud and use an object storage solution on the backend with commodity hardware. Both EFSS and CSG solutions lean towards being very expensive, and in big enterprises often see spotty adoption. However, EFSS vendors tend to stay focused on the ECM 2.0 opportunity; whereas, the grand strategy of CSG vendors pits themselves between two worlds: File sharing and collaboration use cases are adverse to archiving, tiering, and backup use cases. Can you think of any single solution that is great at both active and archive data? This is what CSGs are trying to do, and the reality is that, at best, they will be good at one and not the other. With a foot in the problem space of active data (‘global namespace’) and another foot in inactive data ('cloud archiving'), CSG vendors have taken on two fronts in a far-reaching war; a known recipe for disaster. Some of the cloud storage gateway vendors focus on capacity expansion; a relatively small amount of local storage can be expanded by using remote storage as an extension. This lends itself to unstructured data archiving, typically to remote storage such as Amazon S3 or an on-premises object storage product. In this scenario, many cloud storage gateways act as hierarchical storage management (HSM) appliances, but are modernized, with public cloud storage on the back end. Usage of HSM-focused technologies has dwindled since the falling cost of storage no longer warrants the extensive use of HSM. 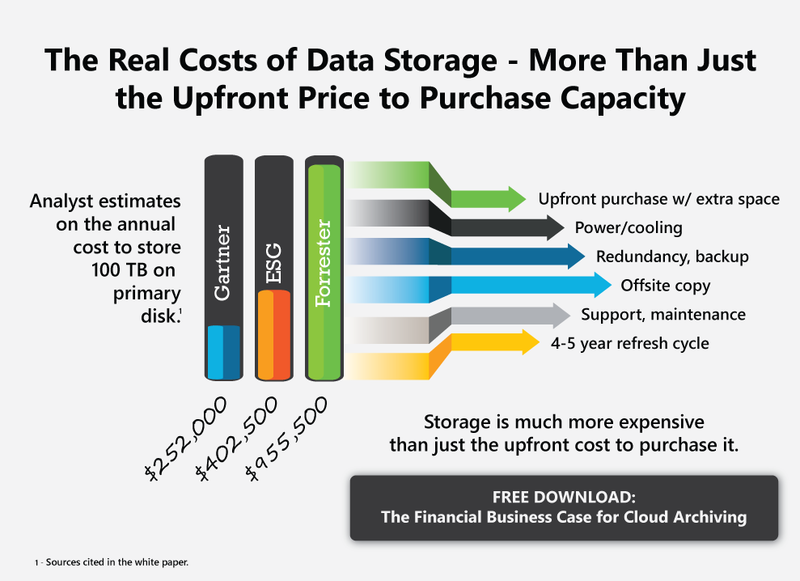 The falling cost of storage argument is a fallacy because falling storage costs do not apply exclusively to the primary storage tier; dropping storage prices apply everywhere. Moreover, the economics of public cloud will always beat out the economics of a do-it-yourself storage solution for low-touch workloads, at least for businesses not operating double-digit Petabyte-scale environments. Thus, for most of the market, public cloud storage will always be a cheaper place than primary storage to preserve inactive and low-touch unstructured data. A more accurate characterization vis-à-vis CSGs and their usefulness for storage tiering is that CSGs (or any HSM appliance) represents negligible or no storage cost savings because they are an expensive device that you have to manage. In other words, the costs of acquiring, adopting and maintaining the CSG erase the cost savings of tiering. At HubStor, we see plenty of interest in the marketplace for storage tiering to the cloud. It is a top use case. The cloud is more convenient than in-house storage for old workloads and, with HubStor’s commercial model, is a significantly lower-cost storage solution for low-touch and inactive data compared to primary storage. Again, CSGs miss the mark because they do not provide seamless storage tiering that works against existing storage investments – they are expensive net new storage infrastructure. In our Financial Business Case for Cloud Archiving white paper, we run through the numbers, showing the cost justification for storage tiering by normalizing and comparing the fully-burdened cost models of in-house and public cloud storage. Is storage cheap? Not so much when you look at the Total Cost of Ownership. Furthermore, capacity expansion using the public cloud is often at odds with the way users and applications interact with files. Unwanted recalls of data from the cloud because of normal user or application interaction plague some cloud storage gateways. File browsers, antivirus, backup and other programs that attempt to enumerate "nearline" data and read the contents could cause performance issues when the data portion of a file is not cached locally and only exists remotely. Gartner says that some CSG solutions are “plagued” with unwanted recalls (retrievals from the cloud). I do not know the specifics here, but this is unfortunate. Indeed, you need to configure storage tiering correctly, or you can incur high costs in data transfer and storage activity from the public cloud that are not necessary. HubStor is not a cloud storage gateway, but it does offer storage tiering functionality that allows you to cloud-enable your existing storage investments. In doing so, we provide policy controls that let you precisely target the data that will reside exclusively in the cloud and seamlessly retrieve if users or applications request it. Our clients have found it very safe to implement tiering policies using last modified or last accessed dates. It is a rare occurrence when an old item reverts to being hot again. Furthermore, in addition to local caching rules, we include the ability to exclude certain applications or process IDs from invoking retrievals from the cloud. This way, you can avoid “file browsers, antivirus, backup and other programs” causing unwanted read activity from your cloud tier. The cloud offers value to many enterprise use cases, archiving being chief among them. CSG and EFSS vendors are ideal for file sharing and collaboration which are active data scenarios. However, most data in the typical enterprise, sometimes 80 percent of it, is inactive and low-touch. Think of it: ex-employee data; litigation data; scanned document archives; machine data/log files; client data; project data that you are legally required to preserve long after a project closes; data you must keep for compliance reasons; data that is just ridiculously old and sitting in primary storage; etc. These are all examples of workloads that will not fit nicely into your file sharing and collaboration space. Instead, they will make a mess of it and be unwieldy to manage. Surprisingly, a cloud solution that elegantly handles the suite of requirements for enterprise-grade archiving has been missing in the object storage, cloud tiering, and public cloud arenas. But a newer class of solutions led by HubStor is emerging to make public cloud the ideal solution for inactive and low-touch unstructured data. Messaging-focused archive vendors and CSGs are too expensive and too cumbersome to be good archive solutions in this environment. The idea is to integrate current storage investments without adding new equipment, and to seamlessly tier data based on policies to take advantage of public cloud economics without being locked in while having a comprehensive suite of data governance, compliance, and discovery controls for a more meaningful cloud experience. I do not think the market for cloud storage gateways will collapse. CSG vendors still have a place in the world, but the impact of EFSS vendors on the CSG market ceiling is obviously sour grapes to entrepreneurs and investors that thought (and invested) based on a bigger pie. With many of the CSG vendors being heavily VC-financed, the realization of a smaller market opportunity will have some investors forcing early exits or perhaps pushing to acquire adjacent startups to help reach into new markets for growth. At HubStor, we take a pure software approach to achieving hybrid cloud storage for our clients. We enable their existing file servers to act as cloud storage gateways, thus not adding any new infrastructure and offering an easier and more cost-efficient approach. HubStor typically does not see head-to-head competitive scenarios with CSG vendors. That is because HubStor is not a cloud storage gateway. However, most of our business comes from IT teams that have first evaluated CSG offerings and concluded they did not align with their requirements. HubStor is fundamentally designed as a scalable, data-aware cloud archive that aims chiefly at the inactive and low-touch data problem. What makes HubStor unique is its approach to delivering hybrid cloud storage; its zero lock-in model; its commercial model; its search-as-a-service; its identity and security synchronization features; and its built-in analytics and cloud data management suite. EFSS solutions and Cloud NAS solutions are the best for active data file sharing and cross-site user collaboration scenarios. The HubStor solution includes link-based sharing of folders and items, but that is only because we see this as a commodity feature which any cloud storage solution should provide (not because we intend to disrupt the EFSS space).